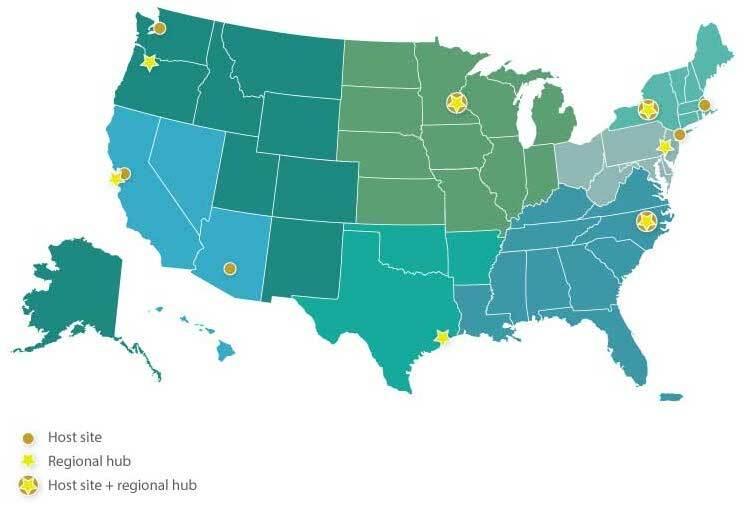 Summer 2015 Building with Biology pilot events took place at eight locations across the United States. 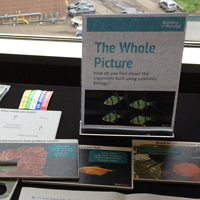 Hundreds of public participants interacted with scientists and other members of the synthetic biology community in these pilot events, which were held at the following locations: Arizona Science Center, Chabot Space and Science Center, Museum of Life and Science, Museum of Science, Boston, New York Hall of Science, Pacific Science Center, Science Museum of Minnesota, and Sciencenter. 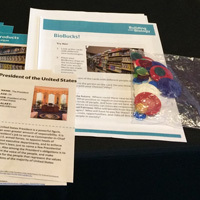 Building with Biology pilot events promoted conversations among scientists and members of the public about synthetic biology through hands-on activities and forums. 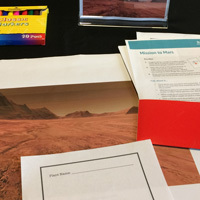 Pilot hands-on activities, facilitated by scientists and educators, were short activities lasting less than 15 minutes that were often presented at a cart or in a demonstration space such as an exhibit gallery or classroom. Forums were intended for youth (ages 16+) and adults to engage with scientists in facilitated multi-directional dialogue and deliberation (usually 1-2 hours) around a specific question about synthetic biology. 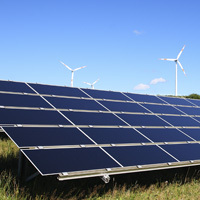 Public Data Summary: Describes data collected from visitors who interacted with hands-on activities at the eight sites. Forum Data Summary: Describes data collected from visitors and volunteers who participated in the forums/conversation activities. Volunteer Data Summary: Describes data collected from volunteers (mostly scientists) about their experiences at the events and/or forums. For more information about the Year 1 pilot Building with Biology event evaluations, contact Liz Kollmann or Katie Todd. Museums and synthetic biology scientists collaborated to develop 19 activities and forums during the pilot year of the Building with Biology project. As a part of activity creation, developers gathered input from educators, scientists, and publics through a formative evaluation process called Team-Based Inquiry (TBI). 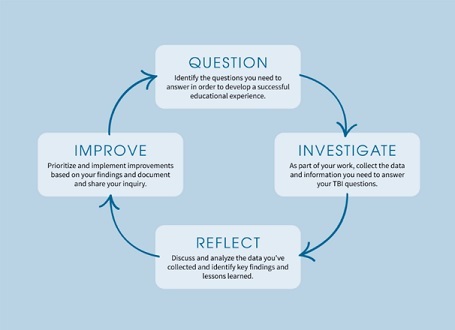 TBI engages professionals - with help from evaluators - in an interative four step process of formative evaluation, and was developed by the Nanoscale Informal Science Education Network (NISE Net; DRL 0532536, 0940143). To learn more about Team-Based Inquiry, you can find guides and videos about the TBI process on the NISE Net website, or you can contact Liz Kollmann. Descriptions of the 19 activities created as a part of the pilot phase of this project are listed below. 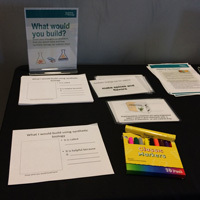 For questions about the activities, please email buildingwithbiology@mos.org, and we’ll put you in touch with the activity developers. 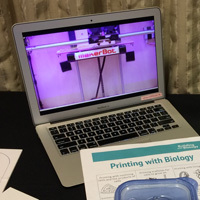 This is a hands-on activity where guests explore current research and future possibilities of 3D printing and synthetic biology. 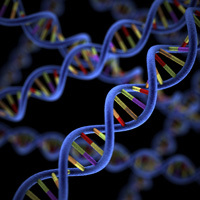 In this forum, participants learn about editing the genome, its benefits and risks, and share your opinion about potential real-world applications. 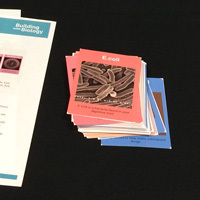 In this activity visitors look at cards that describe different technologies potentially enabled by synthetic biology. 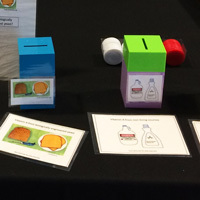 This is a hands-on activity in which scientists, educators, and visitors discuss the development of four different types of vaccinations. 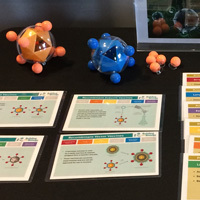 This game showcases one example of how synthetic biology could help society and allows for discussion between scientists and the public. Visitors are presented with two scenarios. In one, they can make a super organism to save the day, in the other, they can make a superhero. 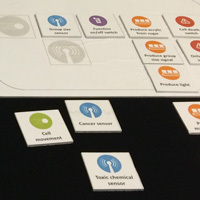 This is a hands-on activity where visitors design a model cell that can solve a current problem being tackled by synthetic biologists. 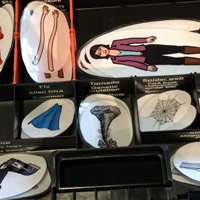 This is a card game exploring microbes that synthetic biologists use in their research and the ways that they engineer them to make new things. This is an open-ended conversational experience in which visitors imagine and draw the things they would want to have on a human colony of Mars. 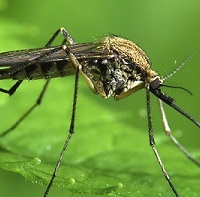 In this forum, participants consider two case studies and share your views on the future of mosquito engineering. 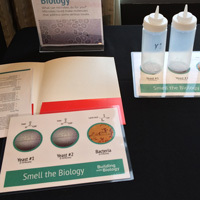 Visitors smell the byproducts of yeast and bacteria fermentation and ask, "If a microbe could produce your favorite smell, what would that be?" 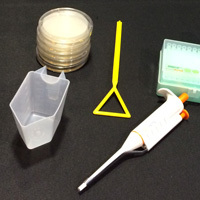 This is a hands-on activity where visitors practice basic lab techniques of pipetting and spreading bacterial cultures. The Whole Picture is an activity in which visitors build a picture of a transgenic organism that synthetic biologists have already made. 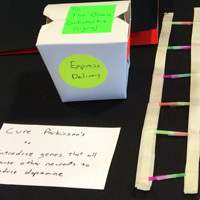 Kids are asked to rethink the nature of viruses by building their own custom disease-fighting virus. This is a hands-on activity exploring different existing sources of vitamin A and how yeast can be modified to produce vitamin A. This is a drawing activity where visitors can imagine and draw their own solutions to all sorts of problems using biology. 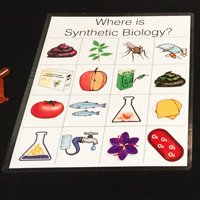 In this “bingo” type game, participants identify images that match descriptions of applications of synthetic biology with images. 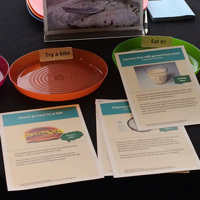 In this activity visitors learn about new foods being developed using synthetic biology techniques. 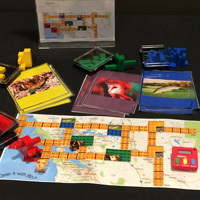 In this forum, players must negotiate, trade, and invest their resources to work together to make their dream project a reality.